Quick Facts About Prohibition & Repeal in the U.S. The prohibition of alcohol in the United States began in 1920 and ended in 1933. There are many things that happened during prohibition and now there are many celebrations on the anniversary of what is referred to as Repeal Day on December 5th of each year. Below are a few quick facts about "The Noble Experiment" and you can read a more in depth story about prohibition in The United States Prohibition of Alcohol - 1920-1933. The 18th Amendment is the only constitutional amendment that has ever been repealed by another amendment (the 21st Amendment). One of the biggest misconceptions of the Prohibition era is that the mob controlled all of the liquor supplies. While The Outfit, Al Capone and mobsters in other major metropolitan areas did control a considerable amount of alcohol in their territories, the majority of the production and trafficking was done by individuals. Interesting fact...Templeton Rye Whiskey is being produced again today after being one of the few distilleries in Iowa during Prohibition and is said to have been "Al Capone's whiskey of choice." The term speakeasy is said to come from bartenders telling patrons to “speak easy” when ordering so as not to be overheard some 30 years before prohibition. While the speakeasy was often funded by organized crime and could be very elaborate and upscale, the "blind pig" was a dive for the less desirable drinker. The term "The Real McCoy: came out of this era. It is attributed to Captain William S. McCoy who facilitated most of the rum running via ships during prohibition and would never water down his imports, making his the "real" thing. Interesting fact...Rumrunners bringing liquor from Canada were from all parts of society using a variety of methods including running cars across the frozen Great Lakes and stuffing bottles in women's clothing who walked across the bridges. 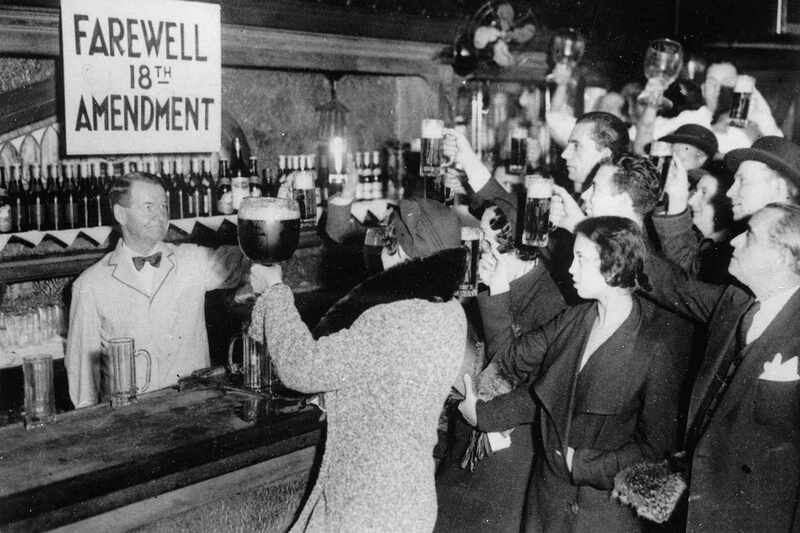 It was on December 5th, 1933 that the 21st Amendment was ratified and Prohibition ended. This day has since been known as Repeal Day. Interesting fact... The first legal bottle of beer produced by Washington's Abner Drury Brewery was delivered to President Roosevelt at the White House shortly after midnight on April 14, 1933 and stored in the President's pantry because he was still asleep. Dewar’s Scotch - the first legal whisky to arrive in the U.S. - hit New York’s South Street Seaport docks the moment the law was put into action. Joseph Kennedy, Sr. (JFK’s father) happened to be the US agent for the brand. Many people have suggested that Joseph Kennedy was a bootlegger (which he may or may not have been), but what he really was, was the owner of a company named Somerset Importers. Somerset owned the exclusive rights to import Dewar’s Scotch and Gordon’s Gin, and right before repeal, Somerset stocked up. Big time. Once Prohibition was over, they sold the premium liquors for a hefty profit, and Joe was a rich man. The umbrella becomes a clever symbol of the post-prohibition era and this phrase "wet under the umbrella" referred to the many wet days to come. To honor the 21st Amendment, many celebrations begin at 9:00pm (or the 21st hour) on December 5th. Many Repeal Day hosts insist that the first drink of the evening be a non-alcoholic beverage to remind everyone of the dry days of prohibition. After the mocktails, whip out a few of the classic cocktails that were all the fashion at the time and are still great libations.